This short article decribes some of the astronomical terms used in the three full articles on the History of Astronomy that can be found on the NRICH website. The first of these articles can be found here. The celestial sphere is an imaginary sphere concentric and coaxial with the Earth on which the fixed stars and planetary movements can be projected was first proposed by the Greek Mathematician Eudoxus (408-355 BCE). The Earth rotates on its axis and the celestial equator is in the same plane as the earth's equator. 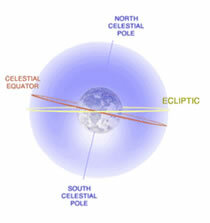 The intersections of the celestial equator and the ecliptic are the equinox points where the lengths of the day and night are equal. The Sun, and the orbits of Earth and the planets, are all in or close to the plane of the ecliptic. Seen in this order from the Earth: Moon, Mercury, Venus Sun, Mars, Jupiter, Saturn. All the planets revolve around the Earth from West to East on their individual orbits. The heliacal rising of a star occurs when it first becomes visible above the eastern horizon at dawn before it is hidden by the brightness of the rising sun. Each subsequent day, the star will rise slightly earlier and remain in the sky longer before it is hidden by the brightness of the sun. Eventually the star can no longer be seen in the sky at dawn because it has already set below the western horizon. A star will reappear in the eastern sky at dawn approximately one year after its previous heliacal rising. Ancient astronomers realized that after about a year, the same star reappeared, and a particular 'evening star' and corresponding 'morning star' were actually the same because the star occupied the same relative position in the sky. When observing the heliacal rising of stars, it became apparent that the movement of the sun lags behind the movement of the stars. The path of the sun in this eastward drift is along the ecliptic. When observing the night sky, it quickly became apparent to ancient people that a group of stars appear to rotate around a particular star in the sky, called the Pole Star. In the Northern hemisphere today, this star is located by using the 'pointers' of the constellation the Great Bear (Ursa Major) seen on the left of the picture below. The ring of stars that lie in a region between about 9$^\circ$ above and below the plane of the ecliptic is called the zodiac. The zodiac was divided into 12 sections of 30$^\circ$ each by Babylonian astronomers who recognized distinctive patterns of stars (constellations) in each section. The Earth's axis of rotation is very slowly, but continuously, changing. As the projection of the axis moves around the celestial sphere, the role of the North Star changes from one star to another. This movement of the axis, called precession, is very slow and takes about 26,000 years to complete a cycle. This phenomenon is said to have been discovered by the Greek astronomer, Hipaprchus (190-120 BCE). The star Thuban in the constellation Draco was closest to the North Pole in 2787 BCE and in 1793 BCE, it was superseded by Kappa in Draco. Thuban was considered the pole star until about 1900 BCE, when the much brighter star Kochab in the constellation Ursa Minor began to approach the pole. Today, a different star called Polaris in the same constellation is the North Star. It is the brightest star in that region of the sky. Thuban will gradually move back toward the north celestial pole and will again be the pole star in 20346 CE.